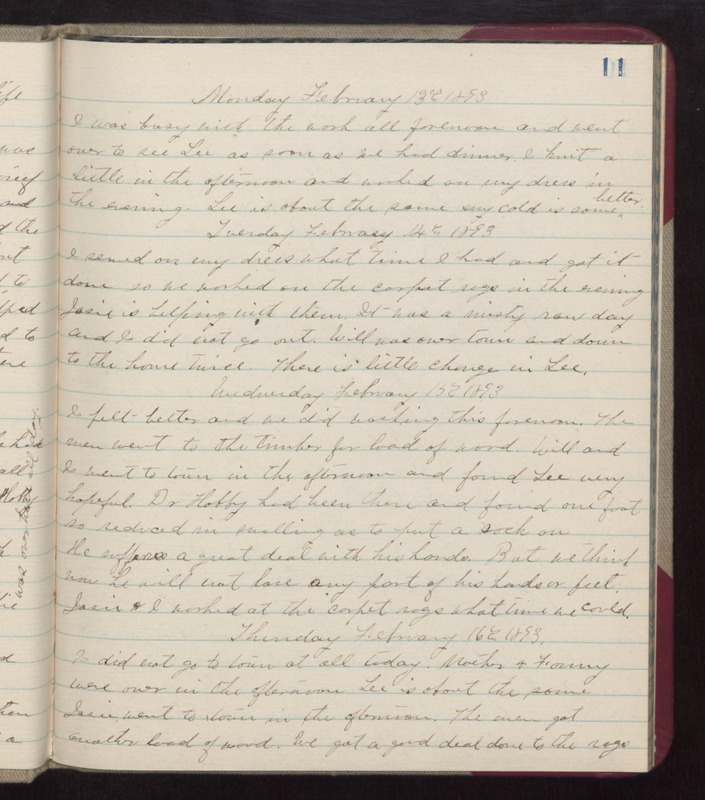 Monday February 13th 1893 I was busy with the work all forenoon and went over to see Lee as soon as we had dinner. I knit a little in the afternoon and worked on my dress in the evening. Lee is about the same. My cold is some better. Tuesday February 14th 1893 I sewed on my dress what time I had and got it done so we worked on the carpet rags in the evening. Josie is helping with them. It was a misty rain day and I did not go out. Will was over town and down to the house twice. There is little change in Lee. Wednesday February 15th 1893 I felt better and we did working this forenoon. The men went to the timber for load of wood. Will and I went to town in the afternoon and found Lee very hopeful. Dr. Hobby had been there and found one foot so reduced in swelling as to put a sock on. He suffers a great deal with his hands. But we think now he will not lose any part of his hands or feet. Josie & I worked at the carpet rags what time we could. Thursday February 16th 1893 I did not go to the town at all today. Mother & Franny were over in the afternoon. Lee is about the same. Josie went to town in the afternoon. The men got another load of wood. We got a good deal done to the rags.